What motivates us to do something we thought never possible? What compels us to go for our goals rather than just dream them? 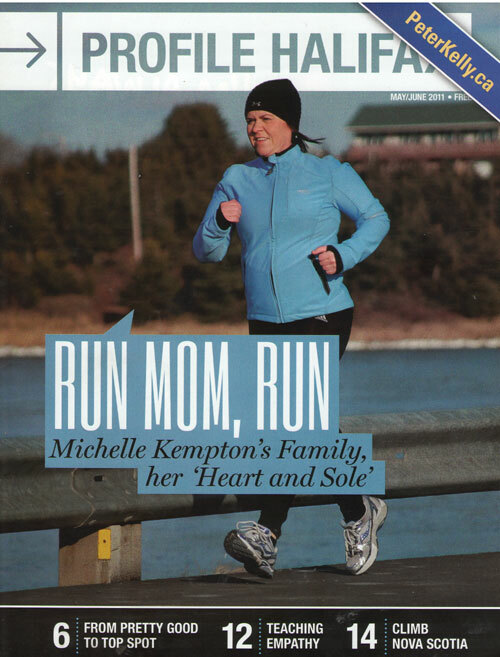 For Michelle Kempton, a thirty seven year old mother and wife who did more than just dream of her goal, it was her health and the thought of her family that pushed her forward. A couple of years ago Michelle weighed in at 285 pounds. Although she had a husband and two wonderful twin boys, she lacked energy and confidence. She took her boys to the park but was not capable of engaging in their high-energy activities. When her father suddenly became ill, Michelle took a new look at her life. Diabetes runs in her family; she could get it too. Michelle was not about to accept that so she decided it was time to make a change. She wanted a healthier lifestyle not only for herself, but for her family as well. Her boys were growing up fast and she wanted to be a role model for them. Michelle got on track with a personal trainer and her fitness took off from there. Diets and weight losing techniques, she had tried them all. However, there was one thing of which she was new to: running. It was very difficult at first and seemed almost impossible, but she worked through the rough start and built up stamina. "It's important to run in intervals," Michelle stresses. "one minute of running, one minute of walking. Start out small, like for twenty minutes doing this. Everyone has to find what works for them." Now she has lost 120 pounds and averages around three to four kilometres each time she goes for a run, approximately three to five times a week. Her boys, now six years old, have become interested in this sport and have taken up running themselves along with her husband. Not only do Michelle and her husband now race, but their children have started to as well. When Michelle talks about why she runs, the love she has for her family is apparent; running is not a vain or selfish pursuit, but an attempt to provide herself and her family with a better life. "Most importantly, I run to be a positive role model for my 6 year old twin sons. Because my children are young, they don't remember me as a morbidly obese person; instead they see me as an active mommy that is happy, healthy and can run and play with them." Michelle also notes how running has been great for her marriage. Michelle and her husband recently took a trip to Quebec together and instead of driving up Mount Royal, they chose to run. "We have more time to talk and enjoy ourselves," she elaborates. Eating healthy is also an extremely important factor when exercising. "We don't eat unhealthy foods anymore," says Michelle. "Sure we'll have a treat now and then but it's not the main food source. The fuel (food) you put in you will definitely affect how you run will go that day." After awhile Michelle began noticing that there was not much socializing going on at the running events she took part in. So she decided to shake things up. Now after races the runners will have big picnics or luncheons, along with anyone else who wants to come. "not only is it a cardio thing, it's (become) a social thing" Michelle says. She has taught Learn To Run classes at Running Room and at the Casino. Michelle is a huge advocate of running, and to show her passion for the sport she became one of the founding members of the Heart and Sole Club. The club is for everyone - at any age and at any level of fitness. They meet on Sunday mornings in front of Two If By Sea Cafe at 66 Ochterloney Street in Dartmouth. There are different categories or levels of running any one to start off at. Michelle explains; "you can run a 5, 10, 15 or 20 kilometre run. We have people join who are new to running and we have elite runners with us." The Heart and Sole Club is for people to find partners to run with so that everyone can encourage one another to keep striving ahead, and to improve their skills and times. The club also allows you to battle different obstacles such as hills and trails. A last few words of wisdom from Michelle: "Have the confidence you can run. You should talk with your doctor first so that you know it will work for you. Join a club! Running with friends is a fabulous experience! It's easier to stay on track when you're accountable to them. Running alone is good, I did it when I began, but now I enjoy running with others. Running can be social, even when by yourself; people you don't even know will be running and wave to you. It's encouraging. The main social component of my life is my running group." Now Michelle is a healthy, confident mother and wife with a whole new attitude. She does not want to be behind the scenes anymore. She speculates, I'm not sitting on the sidelines watching my kids at the park anymore. I'm engaged in what they are doing - running around, playing on the jungle gym. I have the energy to keep up with them and I'm proud now that they have a healthy Mom."